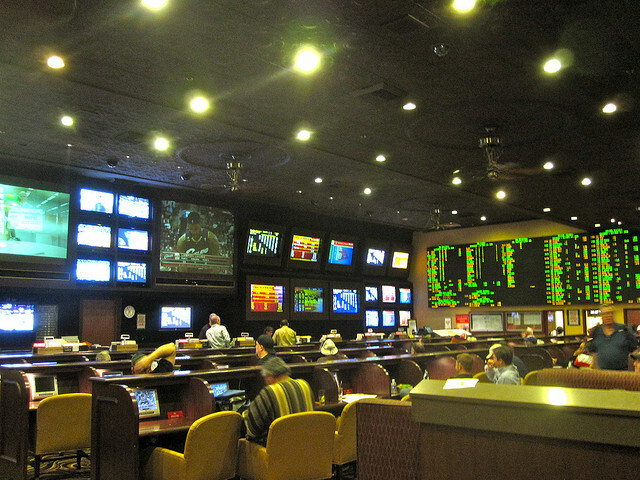 Seats: Approximately 50 with additional booths at the rear of the sports book. Screens: 6 Big Screens, a dozen 70-inch screens, and several 32-inch screens and individual monitors. The Rio has seen better days but the sports book is still a functional space that is suitable for betting sports or playing the ponies. Large screens are prominent and the individual monitors come in handy if you want a more personalized viewing experience. Free drinks are available for horse players and for larger sports bets ($50+). However, if you tip the ticket writers as you ask for a drink ticket, chances are that you will score at least a couple of free drinks. One plus for those choosing The Rio for their sports betting is the Sports Deli, located directly adjacent to the sports book. If you like chicken wings, the wings served at the Sports Deli are some of the best in town – the giant sandwiches are impressive as well. You certainly do not have to go far for some good grubb if you decide to spend time at The Rio sports book.